Yaakov Yitzhak haLevi Horowitz (Hebrew: יעקב יצחק הורוביץ), also known as “Lubliner” - tzadik, one of the spiritual leaders of the Hasidic movement, called haHozeh miLublin - "the Seer", "the Clairvoyant" of Lublin. The Seer from 28, Szeroka St.
Yaakov Horowitz was born in Józefów Biłgorajski, a small town south of Lublin, where his father Eliezer was a rabbi. His family struggled with everyday financial difficulties. Little Yaakov Yitzhak was distinguished by his serious attitude, reading scriptures and praying. He studied under many illustrious rabbis - in Sieniawa, he studied the Talmud under rabbi Shmelke, later he studied in Leżajsk under the famous rabbi Elimelech and afterwards he stayed in Łańcut. He was betrothed to the daughter of a tavern keeper from Krasnobród and forced by his father to marry her. Right after the ceremony, he fled from his wife and the guests and embarked on a wayfaring from one Hasidic court (a community consisting of a tzadik and his students) to another. He is known to have stayed in the courts of Shmuel “Shmelke” Horowitz of Nikolsburg (Mikulov), Dov Ber of Mezeritch (Mezhirichi) and Levi Yitzhak ben Meir of Berdichev. The biggest influence on the Seer came from the last of his teachers - Elimelech of Lizhensk (Leżajsk). Some time later, the Seer rebelled against his master Elimelech and, disobeying his prohibition, established his own court. As a result, Rabbi Elimelech cursed Horowitz and his followers. Having left his master, the Seer went to Łańcut and Rozwadów. As Maier Balaban wrote, "soon heavens told him to leave that place as well and go to Wieniawa. An angel had charged a simple but godly man with the task of delivering the message. At first, Yaakov Yitzhak did not believe him, and it was only when the heavens repeated the order for the third time that he understood that it was the will of a superior strength, and obediently moved to Wieniawa. "1 The Seer settled in Wieniawa in the 1790s. It was probably Rabbi Elimelech who discovered the Seer’s great gift: the ability to read the past, foresee the future and “see” people and events in most distant places (“Lubliner” saw, for example, what was happening at the Austrian court). The Seer could also unveil the genealogy of a soul, that is, tell about its previous incarnations. While living in Wieniawa, he was famous for his healing powers and therefore crowds of suffering and ill people were coming to him, especially in holiday periods. “Lubliner” became one of the biggest authorities among the Hasids. The Seer’s arrival in Wieniawa sparked a protest from Rabbi Azriel Horowitz of Lublin, known as the Iron Head. At that time, Wieniawa was a small, administratively independent townlet (it even had its own qahal), so theoretically, the power of Rabbi Azriel did not extend to its dwellers. However, for Rabbi Azriel, the arrival of the Seer almost in the outskirts of Lublin meant disgrace and shame. He openly deprecated the Seer and his followers. The argument between the two Rabbis became notorious in the entire Lublin region, with followers of each Rabbi taking part in it. Rabbi Azriel mocked the Seer’s followers’ need to use alcohol in order to enter the mystic trance, as well as the miracles made by Lubliner which, he thought, were just clever tricks for simple men. Meanwhile, the Hasids quickly gave him the nickname “Iron Head”. It meant that Rabbi Azriel is resistant to knowledge and divine marvels and he is unable to acknowledge anything that he can not understand. For the quarrel actually concerned the age-old struggle between the transcendent and the real, that is, the mystique experienced by the few and the arguments of reason which can be verified empirically. The argument between Rabbi Iron Head and the Seer ended when people of Lublin became to sneak out to Wieniawa hoping for the favour of seeing the great “Lubliner”. It secured the acknowledgement of the Seer’s authority and led to expansion of the group of his followers and eventually to his decision to move to Lublin. In Wieniawa, the Seer was receiving wealthy people as well, including officials of the qahal. One of those rich men offered to pay for Rabbi’s move to Lublin. He argued as follows: If Rabbi will settle in our city, the glory will also reach its citizens, Lublin will become famous and future generations will learn about it from books. Apart from that, the current citizens will benefit as well, as grace will be passed onto them by the Seer, moreover, many pilgrims will come to Lublin and they will need to be taken care of. Rabbi believed that the evil powers might attack him when he would be alone. And, allegedly, that exact thing happened. He was sick, lying alone in his room and on the following day, although the window was closed, one of his students found him outside, in bushes, covered in blood. Since that day he reportedly suffered from illness for one more year and died in great pain. 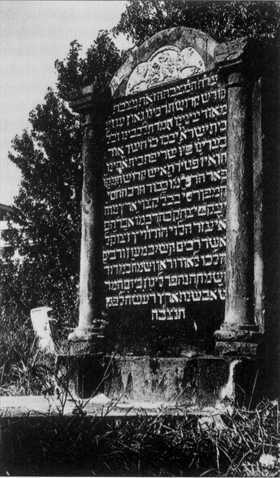 The Seer of Lublin was buried in the old Jewish cemetery. Today, Hasids from all over the world still pilgrimage to his grave, living the kvitlech, small sheets of paper with requests for blessings, next to it. The Seer died on the date that marked the anniversary of the destruction of both the first and the second Temple in Jerusalem. For the faithful, this is the proof of his greatness and sanctity. by sublimity our strength, the light of our eyes, the love of our heart. The Seer of Lublin has become surrounded by many legends. Memory of Yaakov Yitzhak Horowitz remains alive among today’s Hasids. It is boosted by the stories about Rabbi’s miraculous feats. Apart from the story of his death, two of them have become especially famous. The first one is taken from Maier Balaban’s book "Żydowskie miasto w Lublinie" (The Jewish Town in Lublin). The most important sources of knowlegde about Yaakov Yitzhak haLevi Horowitz-Sternfeld are Martin Buber's books. 1 Bałaban M., Żydowskie miasto w Lublinie, tłum. J. Doktór, Lublin 1991, pp. 95-96. 2 See: Doktór J., Horowic Jaakow Icchak ha-Lewi z Lublina in: Borzymińska Z., Żebrowski R. (ed. ), Polski słownik judaistyczny. Dzieje, kultura, religia, ludzie , t.1, Warszawa 2003, p. 613-614. 3 Kuwałek R., Wysok W., Lublin. Jerozolima Królestwa Polskiego, Lublin 2001, p. 43. 4 Bałaban M., Żydowskie miasto w Lublinie, Lublin 1991, pp. 101-102. 5 See: Kuwałek R., Wysok W., Lublin. Jerozolima Królestwa Polskiego, Lublin 2001, p. 45. 6 Bałaban M., Żydowskie miasto w Lublinie, Lublin 1991, p. 95. 7 See: Basiura E., Widzący z Lublina in: Basiura E., Żydzi polscy w legendzie i opowieści, Kraków 1997, pp. 65-77 and Bałaban M., Żydowskie miasto w Lublinie, Lublin 1991, p. 97. Bałaban M., Żydowskie miasto w Lublinie, tłum. J. Doktór, Lublin 1991, s. 94 - 102. Basiura E., Widzący z Lublina, [w:] Basiura E., Żydzi polscy w legendzie i opowieści, Kraków 1997, s. 65-77. Doktór J., Horowic Jaakow Icchak ha-Lewi z Lublina, [w:] Borzymińska Z., Żebrowski R. (oprac. ), Polski słownik judaistyczny. Dzieje, kultura, religia, ludzie , t.1, Warszawa 2003, s. 613-614. Kuwałek R., Chasydyzm i chasydzi, [w:] Kuwałek R., Wysok W., Lublin. Jerozolima Królestwa Polskiego, Lublin 2001, s. 42-48.